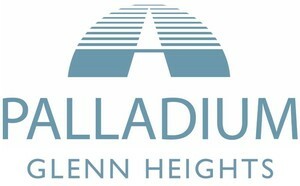 Welcome To Palladium Glenn Heights. Where Luxury Meets Living. We are breaking new ground in Glenn Heights. Contemporary one, two and three bedroom apartments offer quality finishes and a full suite of on-site amenities. Find a daily escape in our well-equipped fitness center, sports court or stunning swimming pool. With options for the whole family including gazebo covered grilling stations, community clubhouse and children’s play structure, we are setting the standard for apartment communities in Glenn Heights. Palladium Glenn Heights offers community amenities to compliment your lifestyle including a state of the art fitness center, an off-leash pet park, resort style swimming pool with sundeck and fire pit, sports court, conference room, business center, children's playground, and a covered event pavilion.